Outlining a couple of debates, and the concept of the Monocultural National Us. Why should we be on the look out for its presence in our lives? Pt.1 of 4. 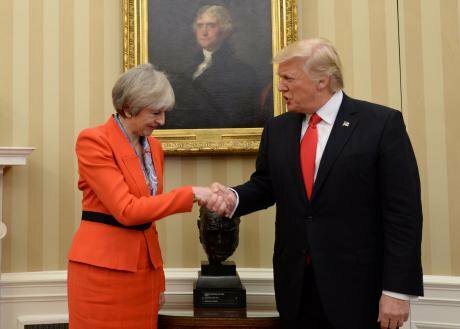 Theresa May meeting Donald Trump in the Oval Office, Washington DC, USA. January 27, 2017. Stefan Rousseau/Press Association. All rights reserved. This is the first part of a 4-part article exploring the concept of the Monocultural National Us in Europe and beyond. See other parts here. In openDemocracy’s Can Europe make it? section, we have been engaged in two debates which are gradually merging together: the latest round of our many discussions on the nature of populism; and a debate on the rise of the hard right, started by Edmund Fawcett and taken up by Anthony Barnett, Jan Zielonka, Michael Sandel and others willing to attempt an unblinking look at the political failures of liberal democracy that have led to this profound crisis in the body politic. Michael Sandel unlocked a rich seam in this enquiry when he insisted that: “it is a mistake to see only the bigotry in populist protest, or to view it only as an economic complaint… For those left behind by three decades of market-driven globalization, the problem is not only wage stagnation and the loss of jobs; it is also the loss of social esteem. It is not only about unfairness; it is also about humiliation…”. He goes on to explore how ‘liberal neutrality’ by avoiding rather than engaging with our moral disagreements, “flattens questions of meaning, identity, and purpose into questions of fairness. It therefore misses the anger and resentment that animate the populist revolt… the cultural estrangement, even humiliation, that many working class and middle class voters feel; and it ignores the meritocratic hubris of elites.” It is this hollowing out of democratic public discourse and disempowering of ordinary citizens which has paved the way for “a populist backlash that seeks to clothe the naked public square with an intolerant, vengeful nationalism”, he argues, reminding us that “Donald Trump is keenly alive to the politics of humiliation.” And the only way out for our democracies is to better understand “the discontent that is roiling politics in the US and in democracies around the world”, and create a politics that can respond. Above all, “it is necessary to engage in a politics of persuasion”. An apparent contradiction at this point in Ronchi’s argument invites some closer attention. Only a sentence or two after calling for new forms of cooperation, and announcing the “implosion of liberal democracy” in societies “torn apart by decades of neoliberalism”, he is urging more “conflict” and “polarisation”. How are we to judge which conflicts serve in the interests of a liberal democracy, and which tear their fabrics apart? What solidarities enhance and which undermine? As Ronchi so pertinently asks: “Is [it] possible for liberals to re-appropriate for themselves the theme of community without giving in to the nationalists, or worse still to the nativists”? Viewed from a media perspective, in a context where incivility, fear and rage seem to have gripped our ‘mature democracies’ as never before, the call for more conflict is a strange one. Admittedly, the structure and dynamics of social media, feeding into polarised and chaotic political scenarios everything from predictive algorithms, to psychometric messaging, to liking, trolling and filter bubbles, are a particularly acute angle on this. But outside social media too the assiduous cultivation of ‘Them’ and ‘Us’, the annihilation of empathy and the erosion of the public sphere, is under way in country after country. Michael Sandel calls for engagement in a politics of persuasion, but who is to persuade whom? Are the despised elites really going to begin to listen and then persuade in a different way, just when no one seems capable any longer of persuading anyone of anything, except the imminent threat of a Hobbesian “war of all against all”? In my contribution to this discussion, I will argue that our ills begin with the lack of mechanisms, institutions and fora in which citizens can persuade each other. It is this that is driving the multi-valent polarisation currently tearing our societies apart, and creating an anti-politics much more quickly than we can hope to defend existing democracies, let alone create the empowering politics that we know that we need. When I ask myself how a new politics of empowerment could overcome the humiliation and the grievances, let alone the inequality that Sandel has identified, it is the toxic climate for decision-making that is at the forefront of my calculation. How do we prevent the marginalisation of dissent and defend the presence of an open pluralist public square at the centre of our democracies? How do we hang onto the civilisational skills of listening and changing one’s mind that belong to the dying art of conversation? Where indeed do we draw the line between democratic and undemocratic subject formation in the media, in education, in governance, and in law? There are two premises about democracy that we are losing sight of today, even in the most liberal and advanced democracies. The first is the recognition, recently echoed by Madeleine Albright in her critique of the Trump presidency, Fascism: A Warning, that the best litmus test for the health of a democracy is the way that its minorities are treated. She writes about Trump's disdain for minorities, and instincts that are "not democratic" ones. But the second premise that concerns us here is a warning levelled at democracy itself – the reminder that "Democracy makes the power of the state especially dangerous" as I shall elaborate below. In Europe, in the decade after 9/11, a gathering chorus of commentators pronounced top down multiculturalism (admittedly a flawed beast) dysfunctional, a view subsequently endorsed by a series of western leaders. In the UK, the ensuing swing towards ‘social cohesion’ was accompanied by the creeping resurgence of an often vague nationalism, invoked in such phrases as “British jobs for British workers”, or “what makes the BBC and we British just that little bit different from everybody else”. This was understood to characterise the majority view in some ill-defined, yet cohering way, while simultaneously reassuring Us about our difference from Them. In various western democracies, for example, questions began to be raised about whether or not their Muslim communities belonged to the 'Us'. A more inclusive approach was still perfectly imagineable. You might go around any room, or community, or society, explaining the very different criteria that makes everyone in that set a precious contributor. Surely this approach would be much closer to serving the general interest? Instead we heard more and more about a unitary ‘national interest’. What is lost in democracies that have ceased to be evaluated according to the treatment that they mete out to their minorities, is this important capacity for inclusion. A democracy should be a society where other points of view are weighed in any process of judgment, where the complicating factors these represent are nevertheless taken into account in the final decision, where people are open to changing their minds about what they once thought was the right or the winning side. But our societies are ones where people are readily convinced that they can only win if someone else loses out, and there we have a building brick for the Monocultural National Us, that can only be reassured about Us, if it has located an inferior Them. We don’t really hear much about people changing their minds as a great, maybe the greatest characteristic of a democratic politics in a complex society. But we should hear much more. Nowadays far too many people are far too certain about what they think, and who the winners and losers are, than can possibly be good for most of us, let alone for a peaceful, thriving, co-creative society. What those governing liberal democracies might stand to gain from such an ‘Us’ is a particular tool for majority reassurance in times of trouble. Reassured that it is at the centre of the ’national interest’ each individual interest identifying with the larger entity is empowered by what we might call an amplifying or hyperbolic effect, one that allows them to feel without having to negotiate anything with anyone, that together they have the upper hand. The Monocultural National Us feeds off many of the building bricks of our liberal democratic societies. A society with a first past the post system of elections – winner take all – is always a candidate for the formation of a Monocultural National Us. A society where bullying is prevalent has a similar capacity to rehearse this outcome, since in a bullying scenario there are always three players – the bully, the victim, and the community that allows the bullying to take place, essentially in its name. The Monocultural National Us is a clubbing together in strength of a great many potential weaknesses. This is where the second important premise regarding democracies comes into the equation. It is well summed up by openDemocracy’s early mentor, the sociologist Paul Hirst, who wrote in 2000 that due to the legislative primacy and highly centralised and powerful administration of modern states, “Democracy makes the power of the state especially dangerous” – since its rulers can claim that their policy is derived from the will of the people, and therefore in the general interest. (“J.N.Figgis, Churches and the State”, Political Quarterly, 2000 p.111). We are accustomed to thinking of democracy as the least dangerous of systems, so Hirst’s formulation here is striking. Here again, what is involved is the replacement of a calculation about what different citizens in an internally diverse category might need and might settle for together, along with all the compromises that this must entail, with a slide from those living, breathing negotiations to a winning majority stance which stands in symbolically for the whole, endowing the modern state with a highly deceptive authority in the process. In the decade since the financial crisis, the ‘omnicompetent state’ that concerned Paul Hirst has been struggling for both plausibility and competence. It is all too easy to see how such symbolic identifications and the authority they confer might be increasingly attractive. Defending the ‘sovereignty’ of the people’s will from external and internal threats is a far easier manoeuvre than actually dealing with all the conflicting interests around any given issue which the proper pursuit of the general interest of a complex, diverse society must involve. An aggravated majoritarianism is the result of turning our backs on both these dangers, and it paves the way to a range of scenarios: war-mongering decisions which permit the state to use the ‘will of the people’ to mobilise its coercive powers without just cause; reductive decisions which reduce a complex range of reasons for support to one single ‘will of the people’ prescription; divisive decisions which take a bare majority as the singular, unchanging, ‘will of the people’, neglecting all other points of view or needs; a proliferation of enemy images internally and externally that gradually replaces the élite manufacture of consent; and decisions taken against the background mobilisation of emotions always necessary for the promotion of a Monocultural National Us against Them – particularly those emotions that give people who fear that they might be losers at any given historic moment, a much easier way of joining forces. We have seen all of these in recent years, and the reason for concern is that all are ways of using force that ultimately lead directly or indirectly to violence. There is a rise in aggrieved majoritarianism in Europe and elsewhere, whereby national majorities, seldom even a numerical majority of all the relevant people, are nevertheless encouraged by their political representatives to perceive themselves as a National Us victim to some Other. The most tragic example is how “the frail bodies of a few thousand migrants arriving on European shores” as Charles Heller puts it, “are triggering a major political crisis throughout the EU.” The drive towards closure and the politicisation of migration is so strong after years of tension that a 95 per cent drop in numbers since the peak in 2015 has not registered on the debate. European citizens, sure that their states have lost control, increasingly wish that migrants would simply disappear. Meanwhile, according to the UN migration agency, a thousand have died crossing the Mediterranean so far in 2018. Giorgio Agamben, Italian philosopher and radical political theorist, with his study of the state of exception which has become a permanent state of affairs in many countries in Europe and beyond, remains the outstanding theoretician of this aspect of the democratic state. His work elaborates on and engages with Walter Benjamin’s “Critique of Violence” as well as the thinking of Carl Schmitt. Indeed it is the state capacity for violence and for endorsing violence which makes it urgent for us to recognise the ways in which we can be coopted as citizens into this kind of identification with the National Us. Take the supposedly ‘lone wolf’ killer who attacks multiculturalism as the enemy. He will amplify his power in his own eyes by saying that he alone is setting out to save the nation from itself. Another more normal everyday version familiar to students of populism is the identification with a "strong leader" who can fend off our own vulnerability to the Other. Someone who never seems to have to apologise, and who can enforce an outcome we think that we want. One essential feature of the identification is the amplifying or hyperbolic function. A second component is the unitary nature of the identification. For people who like the world to be clear cut and binary, right or wrong – violence is one way of putting paid to a multiculturalism that is a constant source of humiliation. Both types of enlargement of our status – that of the individual who successfully identifies him or herself with the nation, and the sleight of hand in which the majority somehow stands in for the complex nation-as-a-whole, rely on our belief in the unitary nature of the Us that makes us different from Them. But is this really credible in either case? The unitary nature of a nationalist identification can only exist at the level of a fiction, wilfully adhered to by those with most to gain from the exercise. It must disappear the minute a concrete interest is spelled out, because inevitably there is so much divergence in such large categories. One of the few ways to experience ourselves as united is to concentrate in binary terms on what and who we are not. So a third identifiable feature is the unitary nature of the projected enemy image, turned into a notoriously homogeneous, undifferentiated Other. Anything beyond the binary is an undermining presence, and openness to the other an early victim to this compulsion. As we watch the seemingly inexorable rise of the Monocultural National Us in countries including but not at all confined to Europe and the United States, it is a clear and present danger that the capture, model and preempt cycle of machine learning will amplify this tendency. We can be aware of the signs, but maybe we need to cultivate a much deeper critical acumen, comparable to decolonial or feminist standpoint approaches to assertions of objectivity, neutrality and universality. Part two follows: Why it is so difficult to differentiate between good and bad nationalisms, and why the World Cup might help.